Trout bum is an affectionate nickname for dedicated trout anglers, particularly those who practice fly fishing. Use of the term is similar in tone and meaning to the antiquated term, "Surf Bum." The term was popularized by author John Gierach, whose first book, Trout Bum is an anthology of informal, narrative essays on flyfishing; and magazine articles he wrote before 1986. The Norwegian film Trout Bum (2004) featuring André Brun, is the first fly fishing film on the subject, and has further popularized the term. Fly Rod and Reel Magazine hosts an annual trout bum tournament dedicated to the pursuit of as many trout species as a two-man team of anglers can catch on a budget of only $500. Gierach, John (1986). Trout Bum. New York: Simon and Schuster. ISBN 0-671-64413-0. Troutnut.com Fly Fishing for Trout, close-up trout stream insect pictures and hatch-matching details. The Itinerant Angler, fly fishing podcasts, photoblog, and online community. Flyfish Radio, the original fly fishing podcast. MidCurrent Flyfishing, a daily blog for dedicated trout anglers. Moldy Chum, A Reel Pure production. AEGMEDIA.COM, fly fishing videos, podcasts, adventures, and expeditions. 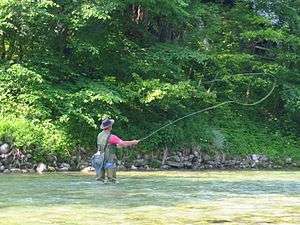 ↑ "Fly Rod and Reel - Trout bum contest". flyrodandreel.com. Fly Rod and Reel. Retrieved 14 May 2015.